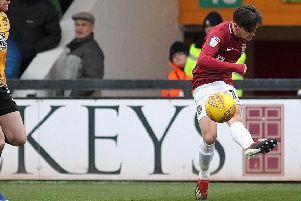 Ash Taylor’s last-gasp goal at Gigg Lane on Saturday saw the Cobblers beat Bury 3-2 and keep alive their hopes of avoiding relegation from Sky Bet League One. The big central defender prodded home the late, late winner to send the travelling fans into raptures, and ensure there is plenty riding on Saturday’s Sixfields showdown with Plymouth Argyle. Taylor had headed Town into an early lead in Greater Manchester, only for Bury to quickly level. Substitute Sam Hoskins restored the Cobblers’ lead before the break, only for the Shakers to again hit back and make it 2-2. It looked as though the Cobblers were going to have to settle for a frustrating draw, only for Taylor to nick it at the death. Chron photographer Sharon Lucey was at Gigg Lane to capture the action, and here is a selection of her pictures.